Restoring a wooden floor is a work of art. It’s one that Quicksand Flooring takes great pride in doing. We understand that every wooden floor has its own unique beauty. We also love to bring that out with our sanding, finishing and sealing wood floor restoration techniques. Wooden floor restoration reveals the grain and patterns in a floor that had previously looked grey and faded. Wood floor restoration covers a whole range of different techniques. These techniques tackle a huge number of problems, from worn and uneven surfaces to loss of colour and pattern. For instance, floor sanding can be used to remove built-up grime and old layers of varnish that hide the colours or grain of your floor. We can then apply a new layer of oil, wax or seal to protect your wood, leaving it looking glossy and new. Floor restoration saves you from buying a new wood floor and celebrates the aged beauty of natural wood. Learning how to flawlessly sand and finish wooden flooring takes many years. Our fully trained staff work only for Quicksand Flooring. We carefully select our staff as the best in their field and they train with us. We never subcontract our work as we firmly believe in loyalty to the customer, providing services that we know are top quality. This enabled us to be one of the leading floor sanding London and Essex specialists, going the extra mile to give a personal touch. We personally train all our staff and teach them that the customer’s satisfaction is of the utmost importance. We know that the top equipment gives the top results; sub-standard sanding machines can leave marks, scuffs or errors that stand out after varnish or oil is applied. 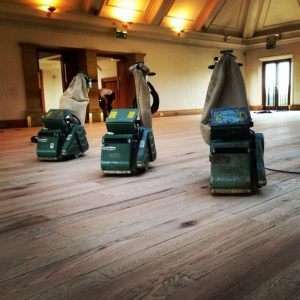 For our wood floor restoration service, we use the latest machinery made by German company Lägler. We have been using these machines for years and achieving the best results for all wood floors. This company is renowned for its quality machinery. Lägler equipment minimises dust and leaves your floor with a professional and even finish. Wood finishes are an important part of floor restoration. A good finish makes the difference between not just a mediocre job and a professional one, but between a floor that needs work every few months and one that lasts years. We tailor all our work to precisely what the customer wants and requires. We make sure to give you all the information possible and advice you want to help you make the right decisions for your floor. There are a huge range of services available to achieve the look you want from your floor restoration. We can use floor staining to achieve the perfect colour or make a bold statement with whitewash. There are several different floor finishing and floor refinishing solutions we can use to achieve the effect you want. Polyurethane Sealant is a one component water-bourne finish for treatment of timber floor surfaces. This type of finish is perfect for residential areas subject to normal amounts of traffic. The high viscosity provides a well-bodied surface making application easy without affecting the self-levelling (this refers to the way the sealant relaxes into the correct thickness along the floor). We provide floorboard filling services with finishing effects available in matt, silk-matt and gloss. For commercial wooden floors that need durability and have a high amount of traffic, such as school sports halls, we can use a two-part polyurethane finish with added hardener. Professionals refer to this as high traffic polyurethane sealant. Natural oil is ideal for solid wood flooring, plank-wood flooring, block strip flooring and cork. It’s hard-wearing and extremely durable, protecting your wooden floor for a long time. The surface is water repellent, dirt resistant, and even resistant to wine, beer, coffee, milk and other fluids, creating the best protection for your beautiful floor. It retains its appearance so you don’t lose the beauty and feel of a natural wood floor. Not only are the grain and patterns visible, but they’re protecting from staining, scuffing or fading. We apply two coats of natural oil. A wax finish is not as common as the previous floor oil due to the maintenance needed to keep it fresh. To maintain a waxed floor it should be buffed every 3 to 4 months with a rotary floor buffer and should be re-waxed every 8 to 10 months to bring the floor back to its original glory. It does, however, offer great external and internal protection for hardwood floors. It gives a unique and special finish to a floor, helping bring out the natural colouration of the wood and is both water and scratch resistant. Quicksand offers not only an application service but also maintenance. We are floor restoration London specialists, so if you’re interested in bringing colour and life back to your old hardwood flooring, or want to freshen up your room, don’t hesitate to get in contact.